Moisturizing and anti-static cream. Cristall Latte is essential to control very frizzy and difficult to manage hair. Light and quick, it can be used daily. Instantaneous effect. How to use: Spread on damp or dry hair and massage delicately. Do not rinse. 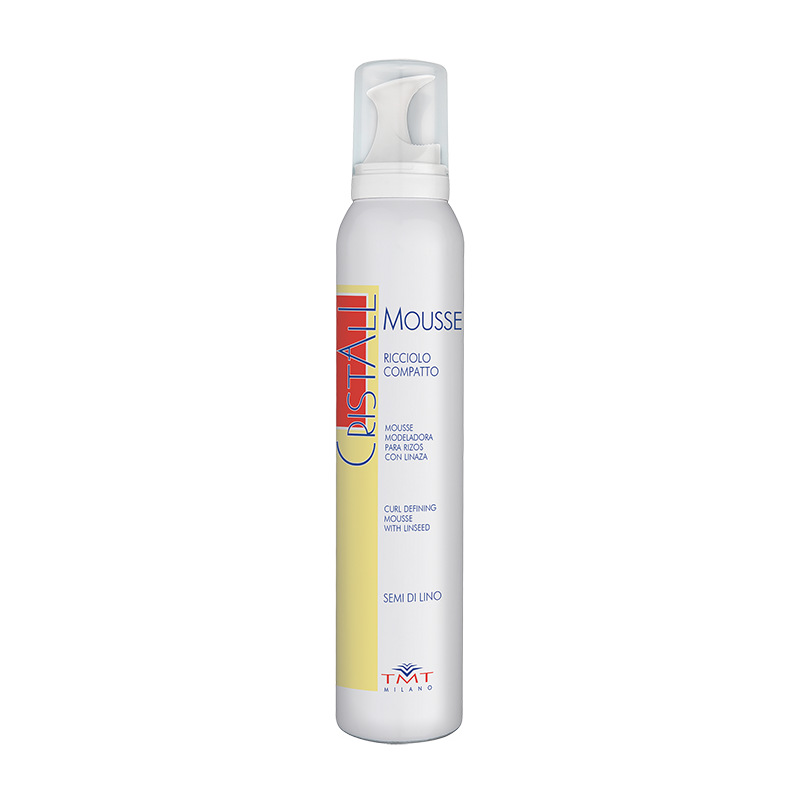 Curl defining mousse with wet effect. Perfect to define light, shiny, compact and supple curls or waves without weighing down. Its extra moisturizing formulation nourishes hair from roots to tips, making curls soft and manageable and giving the right balance. How to use: Apply the necessary quantity with fingers or with a comb to obtain the desired hairstyle. Do not rinse. Moisturising anti-frizz mask for curly hair. Its formulation with linseed gives suppleness and elasticity, making curls and waves compact, soft, shiny and defined. Cristall prevents the formation of split ends, detangles and restructures hair deeply. How to use: After washing hair with Cristall Shampoo for curly hair, distribute the mask evenly using a comb. Let it act 5 minutes, then rinse well with lukewarm water. Cream “smooth effect” with linseed, making hair beautiful and shiny. Restructuring and smoothing action. Cristall protects hair from the use of brushes and hairdryers, restoring the proteins and vitamins necessary for hair natural vitality and beauty. How to use: Apply a small quantity of product on washed and damp hair, distributing well. Repeat the application if necessary. Do not rinse. 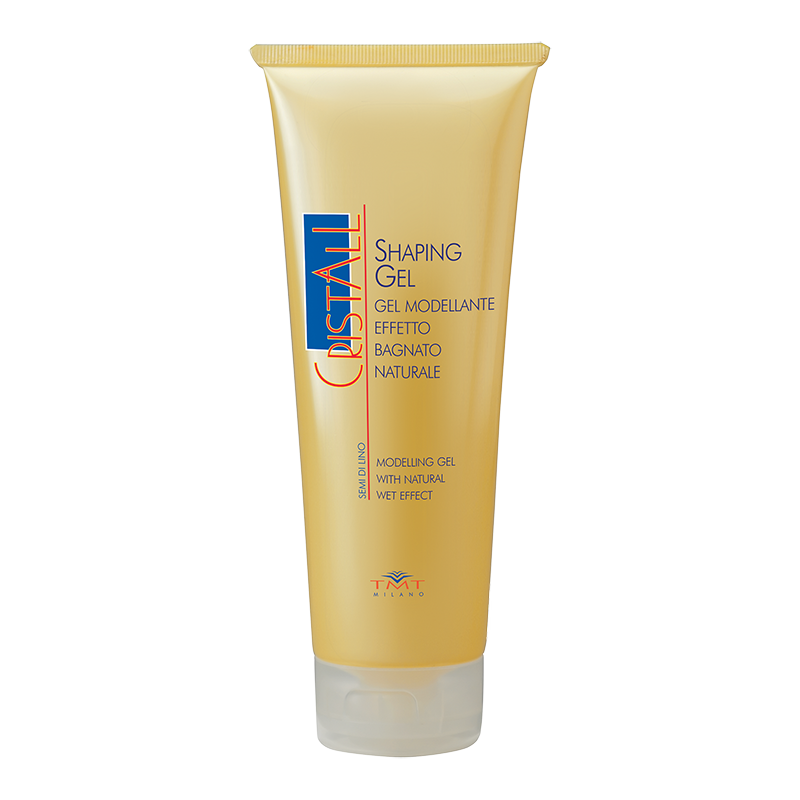 Cristall Gel with linseed, shaping and fixing hair without weighing down. Its elastic hold smooths and shapes, creating a perfect volume. Used with Cristalli Liquidi Semi di Lino, it makes hair extra shiny and bright. How to use: Apply on damp or dry hair and style until obtaining the desired effect, then dry. For more protection and shine, apply Cristalli Liquidi and then Cristall Gel.